Rwanda, a landlocked country in Central Africa bordered by Uganda, Tanzania, Burundi, and Democratic Republic of the Congo has a total land area of 10,169 square miles and a population of over 10.7 million.With many lakes, mountains, savanna, plains, swamps, and rolling hills, Rwanda has a rich diversity of large animals and birds. The economy is heavily dependent upon agriculture with coffee and tea being the major cash crops. Since the 1994 genocide, tourism has picked up with tracking of mountain gorillas being the most popular activity. June through September is the best time to visit Rwanda. The major attractions are its National Parks – Akagera (giraffes and elephants), Volcanoes (mountain gorilla), and Nyungwe (primates). Music and dance play a significant role in their culture. Their most famous dance the Intore is to the rhythm of drums. Bananas, plantains, pulses, sweet potatoes, beans, and cassava are the staples with sometimes meat or dried fish on the side. Rwanda Bradt Travel Guide 978-1841623061 $18 Best Travel Guide to Rwanda! Part I is a traveler’s introduction of 75 pages. 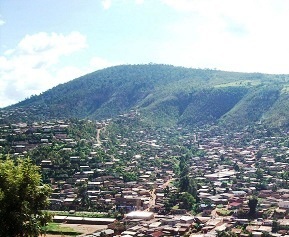 Part II has sections on Kigali, The Road to Butare, Butare, Nyungwe Forest National Park, Lake Kivu, Ruhengeri and Surrounds, Volcanoes National Park, Eastern Rwanda, and Akagera National Park. Maps need improvement, but otherwise excellent content. We Wish to Inform You that Tomorrow We Will Be Killed with Our Families: Stories From Rwanda B002PJ4I2K $6 Gripping account of the genocide in Rwanda through stories from the author and the people he interviewed. Rwanda Burundi Map by ITMB 978-1553413806 $12 1:300,000 Scale. Includes inset map of Kigali and Bujumbura. The first stamps of Rwanda were a set of eight stamps released on July 1, 1962 to mark Independence. The set (Scott #1 to #8) is inexpensive and catalogs for around two dollars MNH or used. The designs show Gregoire Kayibanda and Map of Africa, and a spotlighted Rwanda map. Rwanda along with Burundi was a UN trusteeship territory administered by Belgium before 1962. Rwanda released a set of fifteen stamps on June 29, 1964 in the Animals theme. The set (Scott #55 to #69) catalogs for around $15 MNH and around $8 used. The designs show buffaloes, black-and-white colobus (monkey), impalas, mountain gorilla, African elephants, eland and zebras, leopard, and lions. A similar set was released on April 28, 1965 to publicize the Kagera National Park. The set (Scott #99 to #108) catalogs for around $12 MNH and around $5 used. The designs show zebras, impalas, crowned cranes, hippopotami, and cattle egrets, Cape buffalos, Cape hunting dogs, yellow baboons, elephant and map of Rwanda with location of park, anhinga, great and reed cormorants, and lions. Rwanda gained independence from Belgium on July 1, 1962. The majority Hutus were in power until 1990 when the Tutsi-led Rwandan Patriotic Front (RPF) invaded sparking a Civil War. In 1994, the President was assassinated and that started the Rwandan Genocide when between 500,000 and 1,000,000 Tutsis and moderate Hutus were killed. Following the genocide, RPF restarted their offensive and took control of the country. The country has developed a multi-party political system with the RPF dominating the scene. A set of eight stamps and two miniature sheets released on June 20, 1975 showing African Birds. The set (Scott #652 to #661) catalogs for around $30 MNH or used. The designs show white pelicans, malachite kingfisher, Goliath herons, saddle-billed storks, African jacana, African anhingas, sacred ibis, Hartlaub ducks, flamingoes, and crowned cranes. A set of eight stamps and a pair with a label with continuous design released on December 15, 1986 showing Animals at the Akagera National Park. The set (Scott #1262 to #1269) catalogs for around $18 MNH and around $7 used. The designs show antelopes, shoebills, Cape elands, giraffe, elephants, crocodiles, weaver birds, and pelican and zebras. Akagera National park in eastern Rwanda contains a complex system of lakes making up over one-third of the park. It is the largest protected wetland in Central Africa. A set of four stamps released on June 15, 1993 in the Protection of Vegetable Crops theme. The set (Scott #1375 to #1378) catalogs for around $45 MNH or used. The designs show removing parasites and weeds, spraying pesticides, zonocerus elegans on plants, and phenacoccus manihoti. A few other sets released in the 1990s have similar high valuation. Those include The Visit of John Paul II set of 1990 (Scott #1353 to #1355), Cardinal Lavigerie death centenary set of 1992 (Scott #1370 to #1373), and World Conference on Nutrition set of 1992 (Scott #1381 to #1384). Agriculture accounts for around 40% of the country’s GDP with about 90% of the working population engaged in farms. Major crops include coffee, tea, beans, sorghum, and potatoes. The first coins of Rwanda were Republic Standard Coinage (100 Centimes = 1 Franc) Bronze Francs issued in 1964. The issues have high mintage and catalogs for a few dollars. Gold Coins debut the same year with the release of a 10 Francs 0.1085 Troy Ounce Gold Coin with mintage of 10K. The issue trades for a slight premium over bullion value. Coins $1 and up Recent UNC Francs starts around $1. UNC Sets from the 2000s starts around $15. Brass Essais from the 1970s, Commemorative Independence and FAO Silver Coins in UNC from 1972, etc start around $30. Recent Low Mintage Commemorative Silver Proofs start around $50. Gold Silver Zodiac Issue of 2009, Silver Gorilla Proofs of 1993, etc go well into the 100s. Paper Money $2 and up Recent BU Francs starts around $2. High Value UNCs, Specimen Banknotes, etc starts around $10. Bundles, Rare Specimens, and Early Notes in High Grades starts around $50 and go well into the 100s. Woven baskets, bowls, imigongo( cow dung art), pottery and wood carving are the typical souvenirs of the country. Miscellaneous Collectibles $3 and up Stickers, postcards, etc start around $3. 19th century historical photographs start around $10. Woven Baskets, Swarovski Crystal Bracelets, etc start around $25. Tutsi Lidded Tight Weave Baskets go well into the 100s.